By now, I'm sure that many of the videos I've posted previously are presented differently to many of the other melodeon videos seen on YouTube. I sense that at least some of you gain at least some enjoyment of this, but suspect that others would rather I abstained from such sillyness and behave like a proper musician. Now, some of the reasons that I've done this relate to performing experience, location limitations, availability of props/costumes and, well, because it makes the filming process more unique and fun* for me. Another reason, though, which was perhaps more significant at the beginning, was that my first attempts at filming my melodeon playing were really, really dire. To start with, I was only really thinking about the music and didn't really consider what it might look like. Thus, when I first got a take and played it back, I was alarmed (to say the least) at (i) how my playing sounded a lot worse than I had imagined and (ii) how utterly bored, miserable and static I looked when I was playing. It didn't make for comfortable watching and, of course, the evidence was deleted soon after. That was when a bit of re-thinking needed to be done. 1. Obviously, a major component of a video is the visuals, so it seems a bit hopeful to expect the end result to be successful if you've not thought about this aspect at all. 2. There's no requirement to actually show the instrument being played at all - artwork, atmospheric film clips, 3D graphics or any other suitable medium could be used effectively instead. Having said that, from a player's point of view, I do think that there's value in showing how the instrument is being operated. For melodeon's this is particularly significant, if for no other reason than understanding the use of the bellows. 3. If you're going to be filmed while you play, don't forget issues around 'melodeon face'. If it's an issue for you in general, I guess it's only going to get worse once on film. I suppose a bit of practice in front of the mirror might help, as would a deliberate attempt at relaxation whilst playing. Of course, there's a much more drastic solution, but I suspect that most people wouldn't want to follow me down that route. 4. Think about the filming location carefully. Stuff in the background can certainly be distracting for the viewer. Worse, you probably don't want to be broadcasting your house contents to the world in general. 5. Think about lighting. It's no fun watching a video that you can't see properly. I've had some problems and disappointments with this myself - it's not always easy to figure out what will work to start with. If things have gone wrong, it might be possible to fix them later in your video editing tool, should you be choosing to use such a thing. 6. If you're using a camera with a built-in mic, it's quite possible that the sound won't be as good as you hoped. Again, if you're using a video editing package, there might be tools available that will help adjust some of the main parameters or let you add effects. This can improve matters quite signifcantly, without having to resort new hardware. Alternatively, if you've got the kit to do it, you might consider capturing the sound on a separate recording device, then mixing it back into the video at editing time. In theory, this should give much better results - I've still not had a go at this myself, though. 7. Don't bother playing the same tune multiple times through if you're not going to be adding variations. It'll take much longer to process and upload - and for what ultimate purpose? 8. If you're in the habit of tapping your foot on the floor, make sure that it's not making the camera bounce up and down. It won't be obvious until you play back the result, but can easily ruin an otherwise good take. If your foot is out of view, it might be better to rest it on a cushion, to stop any unwanted vibration. 9. Don't position your instrument too near the mic. 10. Finally, try to enjoy it. It's probably a fact of life that, as soon as the camera is rolling, you'll tense up a little (or perhaps get a full onslaught of nerves). However, as you'll most likely have the luxury of unlimited takes, there's really no need to get wound up like this, despite the frustrations of playing the same thing over and over. Relax - it's supposed to be fun! * actually, sometimes it turns out to be super-frustrating (i.e. the solo Earnest turned out to be a nightmare to film), but it's cool once the result is 'in the can'. 1. Filming so just the melodeon in shot is also an answer. 2. Its nice to have a 'placeholder' with the tune title at the beginning (if you have the software to do it) if that isn't possible put title, type of melodeon and key (if known) into the 'info' box and 'tags' box...it makes it easier to locate (actually do that anyway...I keep meaning to go back over my old vids and put in the info). 3. I find IMO practicing the tune through a couple of times before I press record helps get all the mistakes out the way. LDT adds the following hint on how to convert a WAV file to mp3 using i-tunes. "Import the wav file to I-tunes. Click on track then go to menu up top 'advanced' then 'convert to mp3'. And it will make you an mp3 version." 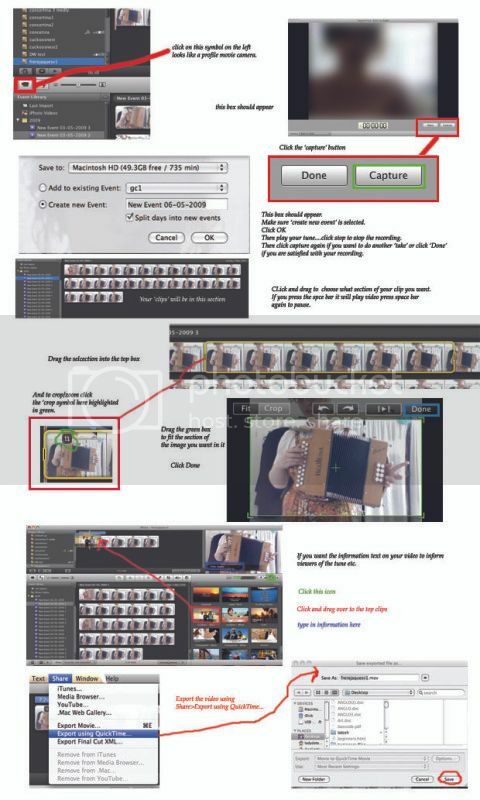 The easiest application to use would be iMovie which can import from a camcorder, or directly from a webcam. Webcam is probably easiest if you have one to hand. - If you're lucky, the webcam manufacturer might have provided you with a video capture application. - There is a Camera application built into Windows 10 that will do video capture. This will probably work great on laptops with built in webcams, though aiming the webcam can be tricky! If it crashes, which it does on mine, the webcam won't be compatible (Windows is pretty rubbish with 3rd party cameras and video recording) but you'll almost certainly find the webcam manufacturer has done a video capture application that will work. Logitech do, for example. - I like to record sound separately using a USB microphone (in my case a Zoom H2) which is running at the same time as the webcam. You don't have to do this, but you'll get better sound quality than you'll get from the webcam. I then stitch the two files together using Windows Movie Maker (also known as Live Movie Maker). This is rather easier than you'd think, especially if you keep the sound file from the webcam - just fine tune the start time for the USB recording to exactly overlap the webcam's sound (you can do this visually in the latest version), mute the webcam sound, and you're off. - If you want to make the sound *really* good, you can mix it/add reverb/effects via a sound processing application like Mixcraft or Reaper before stitching it to the video track in Movie Maker. - There is also a 'record from webcam' option on youtube itself (it uses Flash in the browser to access your webcam) - never tried it myself, but you may have some luck. Once you've recorded your video, go to Youtube and upload your file, setting the privacy settings to 'public' so we can all see it. We agree a tune each month to play, then have a go at learning it/playing it in our own individual styles. Beginners particularly welcome (you'll find a little project like this will give you a useful target to aim at, and I'm sure you'll get lots of encouragement and advice) and more advanced players too - let's see what you can do with the tune, and don't be afraid to interpret it any way you like. Towards the back end of the month we'll run a poll to choose the next tune; first we gather nominations, and I try and choose an interesting selection from our nominations for us to vote on (a vote with 26 candidates is no fun, I think). Winner of the poll becomes tune of the month and we all have a lot of fun recording our own versions of it and sharing them. Vote for as many of the choices as you want, and you can change your mind as the poll goes on. If you want to start your own thread about a different tune for people to have a go at in addition to the 'official' tune of the month, please do it in the Recordings and Videos discussion board rather than in the Tune of the Month board. A lot of the usefulness of Tune of the Month is the focus on one tune (or theme), and several different discussions going on at the same time dilutes that. Each month, we'll also have a 'Theme of the Month' - where we post tunes linked to a particular theme decided by my good self at the start of each month. The theme is deliberately not chosen by poll (it would probably end up with a regional bias which would defeat the purpose), but nominations for new themes can be made in the usual way - post them to the 'Suggestions for Future Tunes' thread.